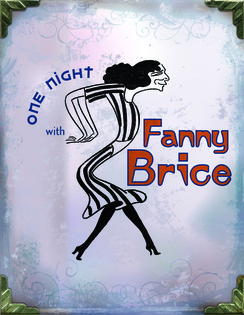 I was really wowed away by the one-woman performance of Chloe Brooks, a 17 year old who at The Thirteenth Street Repertory Company (www.13thStreetRep.org) portrayed through song and 15 character shifts the incredible life story of Fanny Brice, comedienne, singer and actress extraordinaire!!! Fanny was born on October 29th, 1891 in New York City and at the age of 13 sang in a talent contest at Kenny’s Theater and won first prize. She was so inspired by her win that she decided to leave school and go after a career in music. But after several attempts of getting into the music industry she decided to stick to burlesque which at the time was one of the least competitive forms of entertainment. It was in 1908 that Fanny was discovered by Florez Zeigfeld! Fanny went on to be in The Zeigfeld Follies but in 1911 Fanny’s contract wasn’t renewed and so she went on to be teamed up with Blanche Merrill, a songwriter who specialized in working with talented young women. It was with Merrill’s help that Fanny became a comedic entertainer who then returned to The Zeigfeld Follies of 1916 and 1917 and won over the hearts of her audiences with songs like The Yiddish Bride. But by 1921, Fanny decided that she wanted to shed her Yiddish accent and as a result in The Follies sang the song sans accent, My Man. In addition she also underwent plastic surgery to fix her nose, which at the time she felt most characterized her previous Jewish caricature acting. Then Fanny attempted serious roles such as in David Belasco’s production of Fanny in 1926 but unfortunately that didn’t work out well for her. Fanny also starred in such films as My Man, Be Yourself and The Great Ziegfeld but never never became as famous as the other film stars of her day. However, with her indomitable spirit Fannie was unable to distance herself from her connection to The Follies and went on to create the character of Baby Snooks, a troubled toddler known for her tantrums. Well Baby Snooks became an absolute hit and one of Fannie’s most well-known acts! And it was in 1938 that Fanny took Baby Snooks to the radio where the character became nationally well-known and very well-loved! Fanny then remained on radio until 1948 when her contract ended but then she returned for an additional two more years. Now all through her professional endeavors, Fanny had also married three times. Her first marriage was to Frank White (a bartender who had met in 1911 and that lasted a few days), her second husband was Jules W(Nicky) Arnstein (who she also went on to divorce because of his rampant infidelity and his long stretches in jail)and her third husband was Billy Rose who she also divorced in 1937 because of his cheating ways. So if you want to see an amazing performance by Chloe Brooks who fearlessly and seamlessly embraced her portrayal of Fanny, written and arranged by the extraordinary Chip Deffaa, directed by Rachel Hundert and under the superb musical direction of Richard Danley then click HERE and buy a ticket before this wonderful one-woman show sees its final performance! !